Pastor Victor O. Kirk, Sr.
Pastor Victor O. Kirk, Sr. serves as Pastor of the Sharon Bible Fellowship Church located in Lanham, Maryland, he leads with an exciting vision that calls for developing a “Passion for God through preaching, prayer and praise which will result in compassion for people.” Pastor Kirk’s affiliation with Sharon Bible Fellowship Church dates back to when he assumed the position of Executive Pastor serving under founder, Bishop Keith W. Reed, Sr. He worked diligently as his assistant for four years until being asked to take on the role as Senior Pastor in 2004. 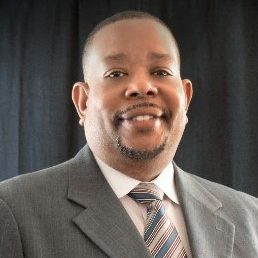 Hindsight reveals prior preparation for this office during his tenure as the Youth Pastor at Beulah Baptist Church in Philadelphia, PA, Senior Pastor of New Hope Baptist Church in Paoli, PA, and as an Associate Pastor of Sharon Baptist Church also in Philadelphia. He received his degree in biblical studies from The Philadelphia College of the Bible and the New Life Bible Institute in Norristown, PA, where he later served as the Assistant Dean of Education. He also holds a certificate in Pastoral studies from the Moody Bible Institute.